Chicago Shakespeare Theater (CST) and The Market Theatre in South Africa host the world premieres of Cadre, written byOmphile Molusi, in Chicago as part of CST’s World’s Stage Series February 15–23, 2013 and in Johannesburg, South Africa, March 18–April 14, 2013. Following Molusi’s internationally acclaimed production Itsoseng, presented by Chicago Shakespeare in 2010, Cadre is inspired by true events in the life of an activist during and after the apartheid era. 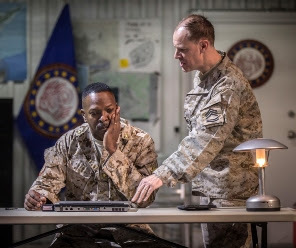 Cadre is produced by CST, with Richard Jordan Productions Ltd in association with The Market Theatre of Johannesburg and Adelaide Festival of Arts. Committed to fostering dialogue on the important political issues explored in this production, Chicago Shakespeare is encouraging broad-based participation by offering all tickets for $20. Revealing the consequences of change in a fledgling democracy, Cadre explores the journey of a young South African man struggling to navigate his way through the tumultuous political landscape of apartheid. Soldiering through the perils of a country consumed by war, he desperately clings to the memory of his first love and the hope of a sweet reunion. Cadre is a personal tale of dreams and change, honoring families, friends and all the unsung heroes who died hoping for a better future. “When I tell political stories, people always connect with the personal—it’s what gets them to the politics and they start getting the bigger picture,” said Cadreplaywright Omphile Molusi. “This play reminds people that the past cannot be hidden, no matter how hard it has been. It teaches us to take care of the present, so that we don’t go back and so we can have a better future in the world.” Omphile Molusi takes on the principle role in Cadre, and is joined by South African actors Sello Motloung and Lillian Tshabalala. Sello Motloung has performed in multiple productions at The Market Theatre, and Lillian Tshabalala reunites with Molusi after performing under his direction in several plays. Performed in English, the production is punctuated with African songs performed in Setswana, Zulu and Xhosa. Winner of a Scotsman Fringe First Award (2008) at the Edinburgh Festival Fringe for his play Itsoseng, Molusi was the first recipient of the Royal Shakespeare Company/Baxter Theatre’s Brett Goldin Bursary Award (2007), which earned the young playwright a life-changing scholarship to study with the Royal Shakespeare Company in Stratford-upon-Avon and develop Itsoseng. The play received additional accolades at the Baxter Theatre and The Market Theatre in South Africa, the Soho Theatre in London, Everyman Theatre in Cork, Ireland and Chicago Shakespeare Theater in 2010, where Molusi was recognized with a Black Theater Alliance Award in recognition of his powerful performance. An actor and playwright, Omphile Molusi has published several plays, including The Sweet Door, Ijo! Pozeng, Itsoseng and For the Right Reasons. His performance credits in the UK and South Africa include: Itsoseng, Romeo and Juliet, The Mirror, The Caucasian Chalk Circle, Much Ado About Nothing, Echoes, Blurring Shine, Julius Caesar, Love of Vultures, Angel in a Blue Dress, Kasiology and Sharpeville. Chicago Shakespeare Theater’s ten-performance World’s Stage presentation ofCadre runs February 15–23, 2013 in the theater Upstairs at Chicago Shakespeare. Performed in English with African songs in Setswana, Zulu and Xhosa. All tickets for Cadre are on sale now for $20. All patrons receive a 40% discount on guaranteed parking in Navy Pier garages. Additionally, Navy Pier is offering $10 parking after 5 p.m. through March 17, 2013. For more information or to purchase tickets, contact Chicago Shakespeare Theater’s Box Office at312.595.5600 or visit the Theater’s website at www.chicagoshakes.com. ABOUT CHICAGO SHAKESPEARE THEATER Chicago Shakespeare Theater is a leading international theater company, known for vibrant productions that reflect Shakespeare’s genius for intricate storytelling, musicality of language and depth of feeling for the human condition. Recipient of the Regional Theatre Tony Award, Chicago Shakespeare’s work has been recognized internationally with three of London’s prestigious Laurence Olivier Awards, and by the Chicago theater community with 70 Joseph Jefferson Awards for Artistic Excellence. Under the leadership of Artistic Director Barbara Gainesand Executive Director Criss Henderson, CST is dedicated to producing extraordinary classic productions, new works and family fare; unlocking Shakespeare’s work for educators and students; and serving as Chicago’s cultural ambassador through its World’s Stage Series. ABOUT THE WORLD’S STAGE SERIES Chicago Shakespeare’s presentation of Omphile Molusi’s Cadre is emblematic of the wide scope of work presented through the World’s Stage Series—a program that brings the world’s most exciting theatrical events to Chicago audiences and presents Chicago Shakespeare’s work abroad. Chicago Shakespeare has collaborated with more than 600 international artists representing 16 countrieson five continents, engaging audiences in a dialogue with the world’s established and emerging theater artists. Strengthening its reputation as a leader in cultural diplomacy, CST partners regularly with respected international affairs organizations, including the Chicago Council on Global Affairs, Chicago Consular Corps, Chicago Sister Cities and World Business Chicago. Since the inception of the World’s Stage Series in 2000, Chicago Shakespeare has imported international productions ranging from pedestrian-based live art events (Australia’s one step at a time like this) to grand aerial and water spectacles (France’s Compagnie Transe Express and Ilotopie); and iconic theaters such asShakespeare’s Globe (London), the Maly Drama Theatre (St. Petersburg) andLa Comédie-Française (Paris). As a leading cultural ambassador, Chicago Shakespeare has presented its work at the Royal Shakespeare Company(Stratford-upon-Avon), The Donmar Warehouse (London), on tour in Germany and Australia, and this past spring, was among the 37 international companies that came together for an unprecedented 37-play “Globe to Globe” festival for theLondon 2012 Cultural Olympiad. ABOUT THE MARKET THEATRE The Market Theatre, founded in Johannesburg in 1976 by Mannie Manim and the late Barney Simon, was constructed out of Johannesburg’s Indian Fruit Market—built in 1913. The theater went on to become internationally renowned as South Africa’s “Theatre of the Struggle.” The Market Theatre challenged the apartheid regime, armed with little more than the conviction that culture can change society. The strength and truth of that conviction was acknowledged in 1995 when the theater received the American Jujamcyn Award. In providing a voice to the voiceless, The Market Theatre did not forego artistic excellence, but, rather, made a point of it. Its twenty-one international and over three hundred South African theater awards bear eloquent testimony to the courage and artistic quality of its work. During the past three decades, The Market Theatre has evolved into a cultural complex for theater, music, dance and the allied arts. Today, The Market Theatre remains at the forefront of South African theater, actively encouraging new works that continue to reach international stages.